Development: The rhodopsin based effector, optoα1AR which on activation generates the second messenger diacylglycerol/IP3, was inserted at the ATG site of the cdh5 gene in the BAC RP23-453P1 (CHORI) through homologous recombination. The resulting recombinant BAC was injected into the male pronucleus of fertilized oocytes which were then implanted into pseudo pregnant females. Resulting offspring were screened for the presence of the transgene (founders). Colonies were established from each founder and tested for expression. Description: The rhodopsin based effector, optoα1AR is expressed under control of the cdh5 promoter, directing expression to endothelial cells. Expression is observed in endothelial cells of vessels. An internal ribosome entry site (IRES) allows for co-expression of lacZ as a visual indicator of expression patterns. This mouse is useful for activating second messengers in endothelial cells. Functional analysis is ongoing. LacZ staining of heart, brain and lung shows appropriate expression patterns. So as to appropriately acknowledge and credit the scientists who have produced the cdh5-optoα1AR-IRES-lacZ mouse strain, it is expected that you will include these individuals in any publication that is submitted prior to the initial publication of this line from the Kotlikoff laboratory. 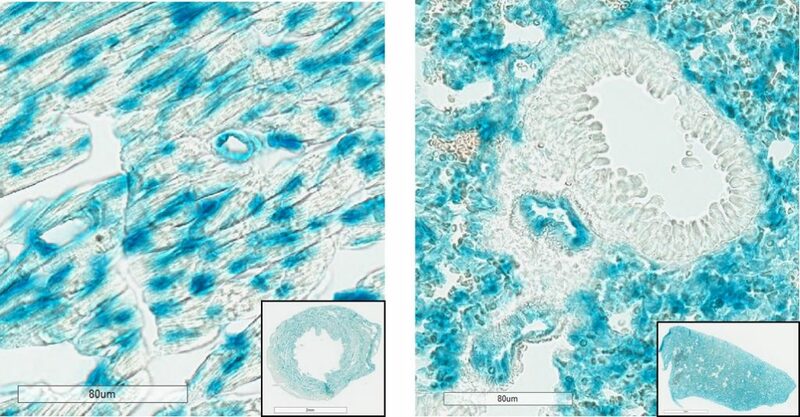 The mouse strain cdh5-optoα1AR-IRES-lacZ was developed by CHROMusTM which is supported by the National Heart Lung Blood Institute of the National Institute of Health under award number R24HL120847.